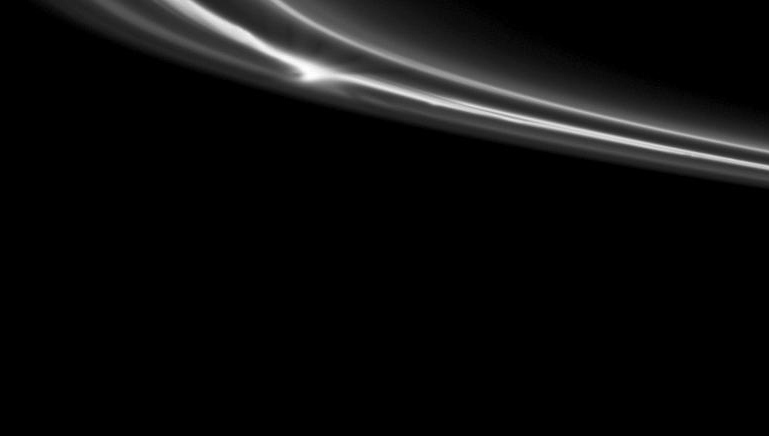 Cassini captured this visible-light image on October 16, 2010, showing a thick clump of icy material in Saturn’s bright F ring casting a “fan” of thin shadows. Clumps like this have been seen many times before and may be caused by the gravitational effects of passing shepherd moons like Prometheus or as-of-yet undiscovered moonlets within the ropy rings themselves. Click here to see how the 63-mile-wide Prometheus can pull streamers of the F ring away as it dips in and out along the course of its scalloped orbit. Positioned just outside the extreme outer edge of Saturn’s A ring system, the F ring is made up of very bright particles of ice loosely organized into ropy strands and transient clumps. It ranges anywhere from 20 to 300 miles wide.